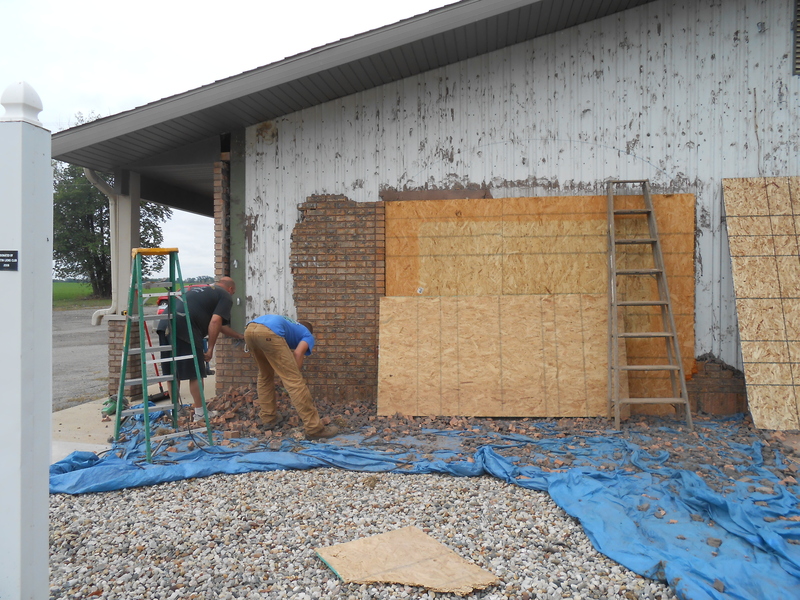 Today we arrived to work at the library to see trucks and men and most of the bricks gone from the front of the library. CONSTRUCTION HAS BEGUN! 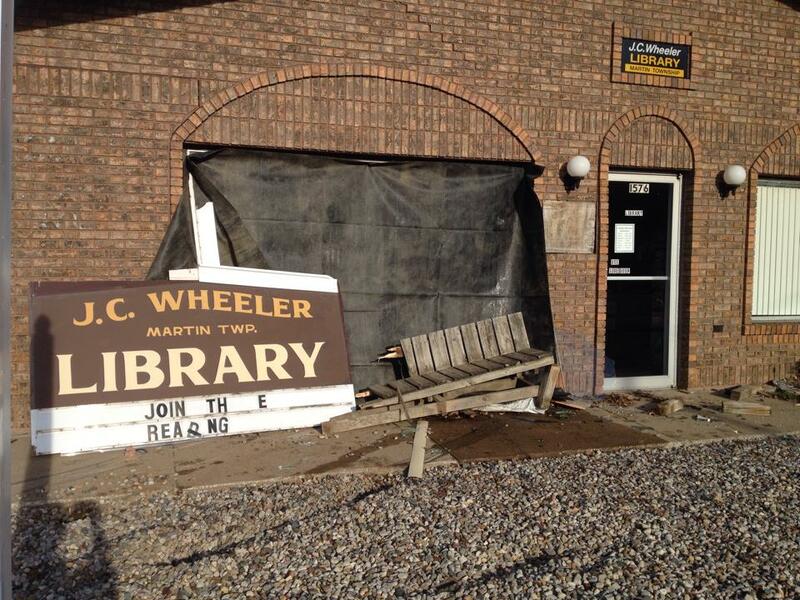 As many of you know, the library had a car crash into it on April 28th. You can read about it and see the photos of that day here. 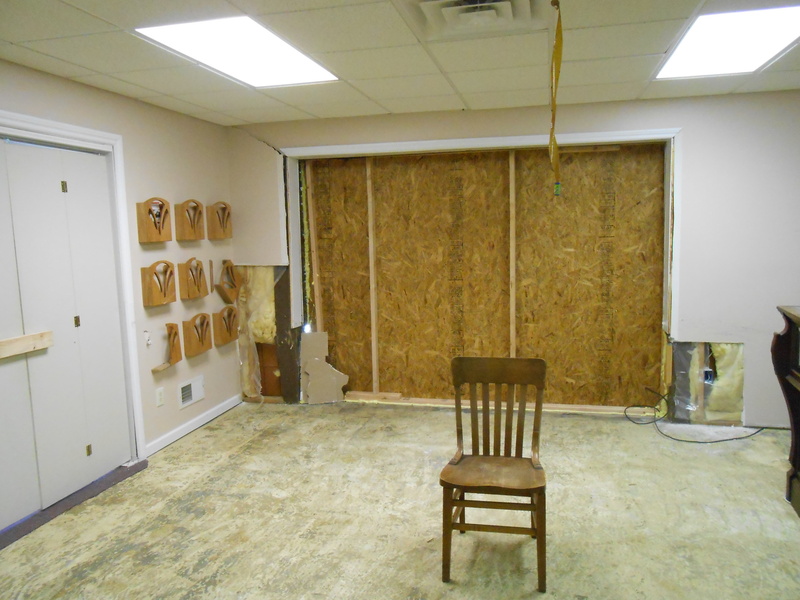 To clear up any confusion, we here at the library are not in charge of the construction. The township takes care of all of that for us. They make all the decisions and we will report what they have decided! Construction day arrived on the day of Book Club and Teen Council, much like the day the crash occurred! It seemed fitting somehow that crash day and construction day would be our busy Book Club/Teen Council day. Alicia and Denise got really creative at making what do with what we had and Alice felt the day deserved something extra special so we had a tea party to the tune of banging hammers and shovels scraping concrete. 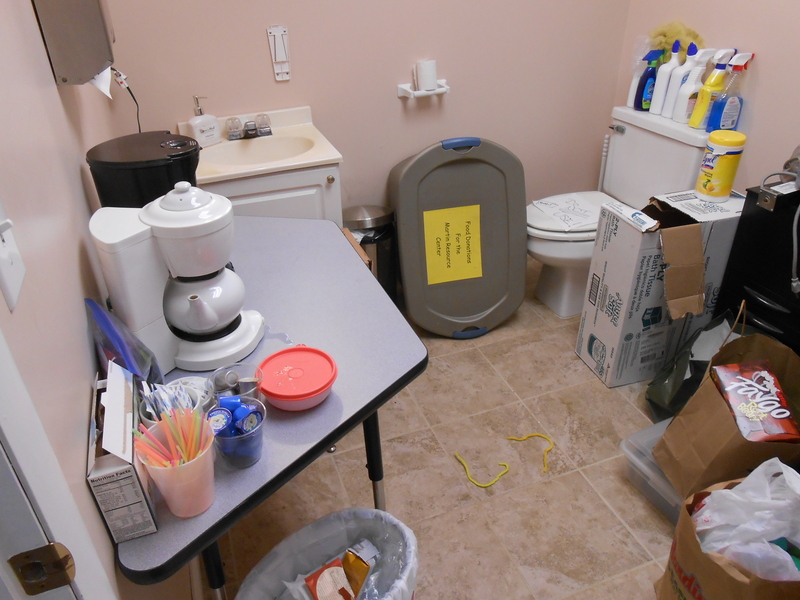 Our staff bathroom/store room has now become a kitchen. When you need tea and coffee regularly, you make sure you can get to them! 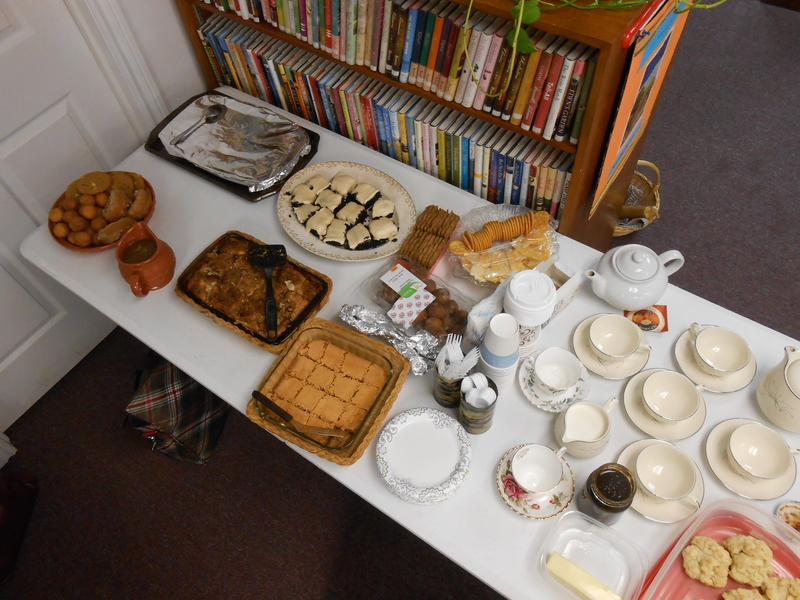 Alice’s tea at book club was a big hit and we had a great turn out of people (and food!). Look at all the yummy food and beautiful tea! 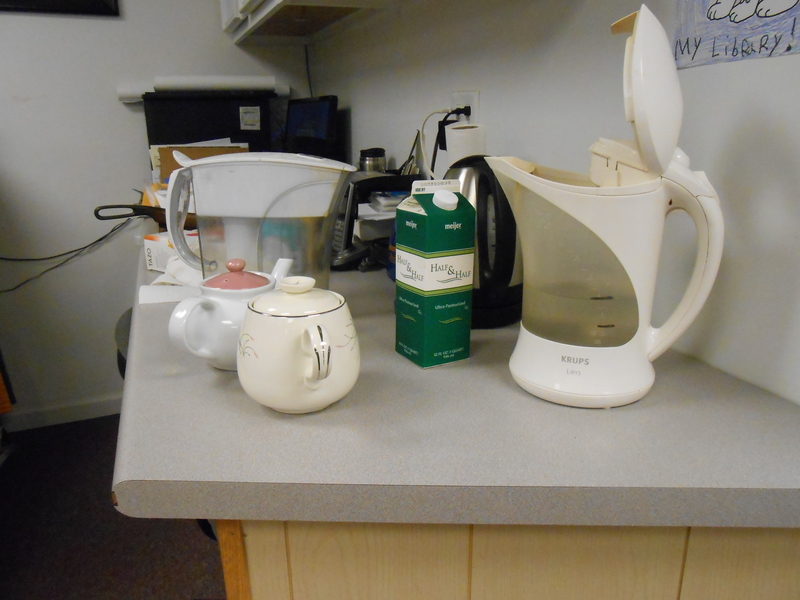 Work counter was turned into the tea making center. What great tea! After our Book Club’s tough read of Middlemarch by George Elliot, everyone seemed to be pretty excited for our next book for Book Club. We had a lot of requests for October’s book about the Salem Witch Trails. The tea party gave the Book Club inspiration and they worked out an entire year worth of books. Tea apparently makes us very organized and proper. Or maybe it was the delicious food. Anyhow, bookmarks are being made and will soon be available with our reading list for Book Club for 2016. Teen Council arrived after school and were happy to devour food, drink a lot of soda and catch up. We discussed all their upcoming activities now until June 2016. Teens, click this link to know how to pack your shoebox. The teens also found a book to read for thier upcoming Book Talk. All in all, BUSY day at the library today and this is exactly what we love to see at our library! 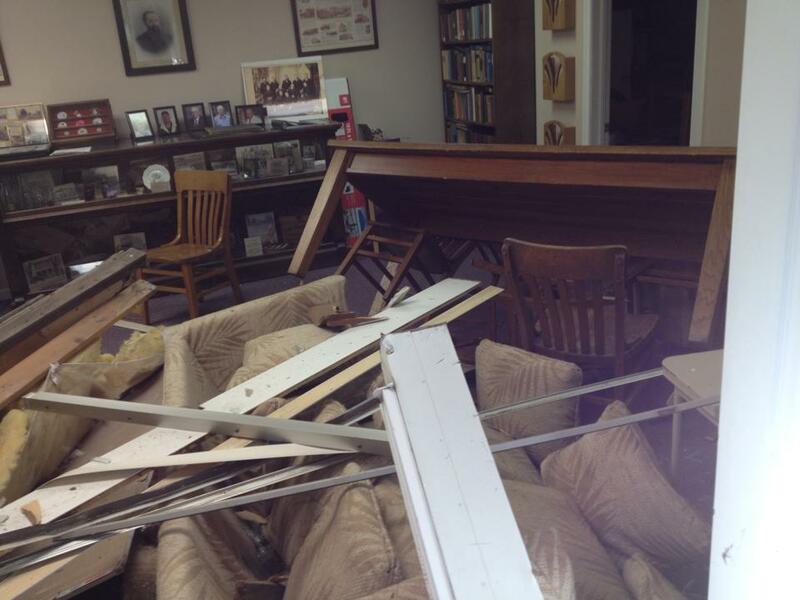 As many of you are aware, on Tuesday, April 28th there was an accident at the library. 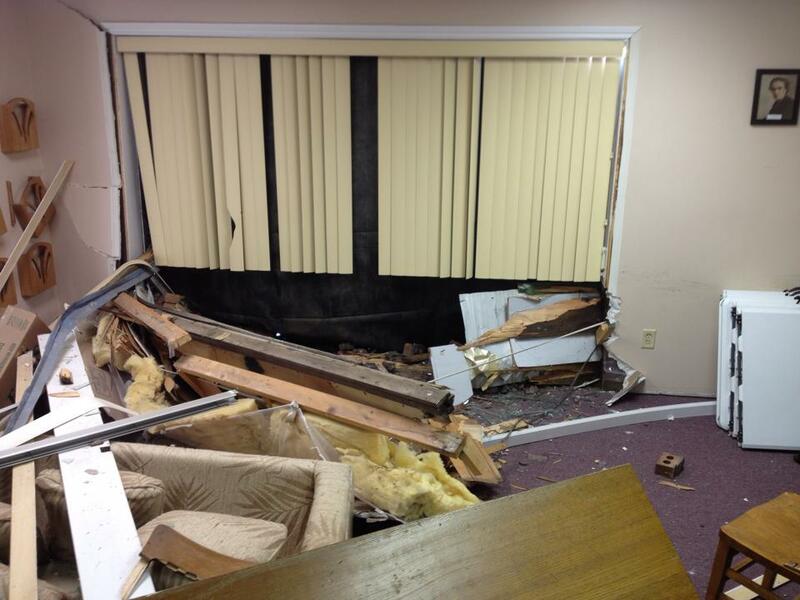 An individual lost control of their vehicle and crashed into the library very late in the night. No one was hurt. The library was hurt, however. It sort of had a major gash. Amazingly, the historical display case was not harmed nor were any of the photos or old books we keep shelved in the back. 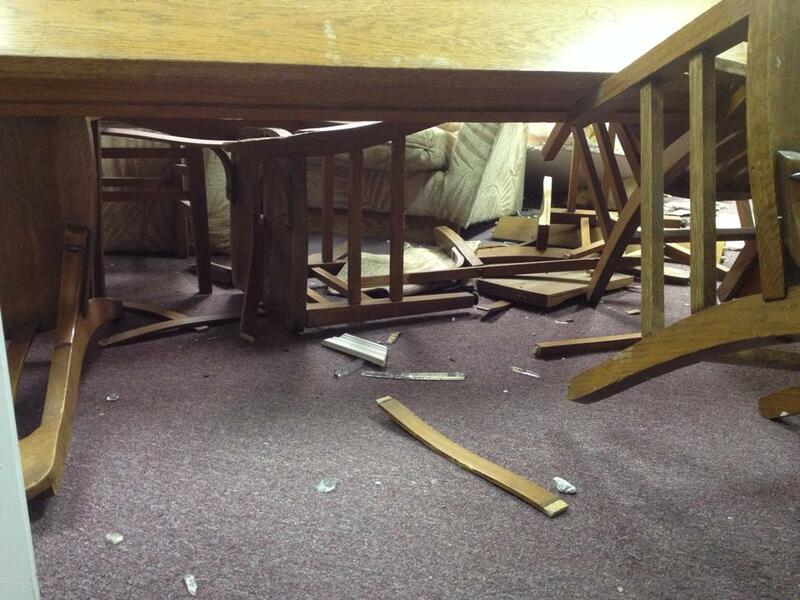 The table survived, but not all the chairs. 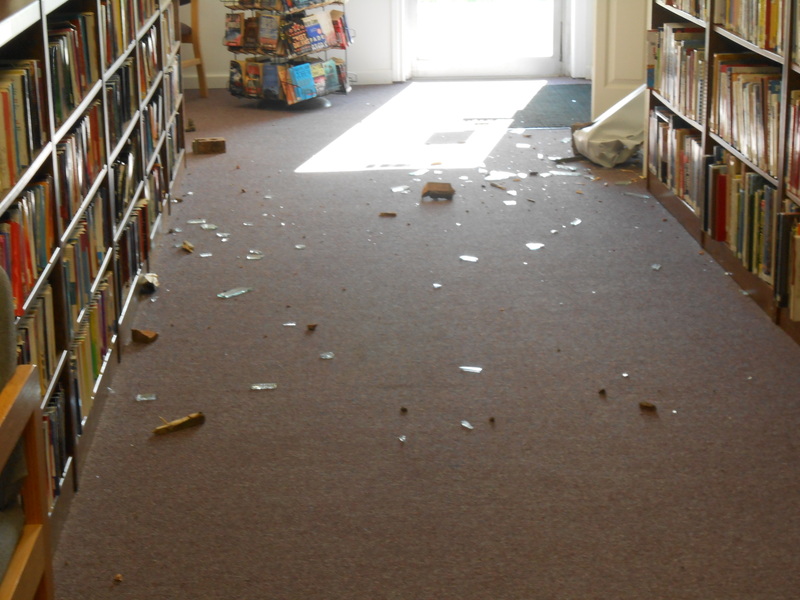 There was glass and brick throughout the front of the library. The sign posts out front were splintered but the sign is still with us, although it is looking rather rough. 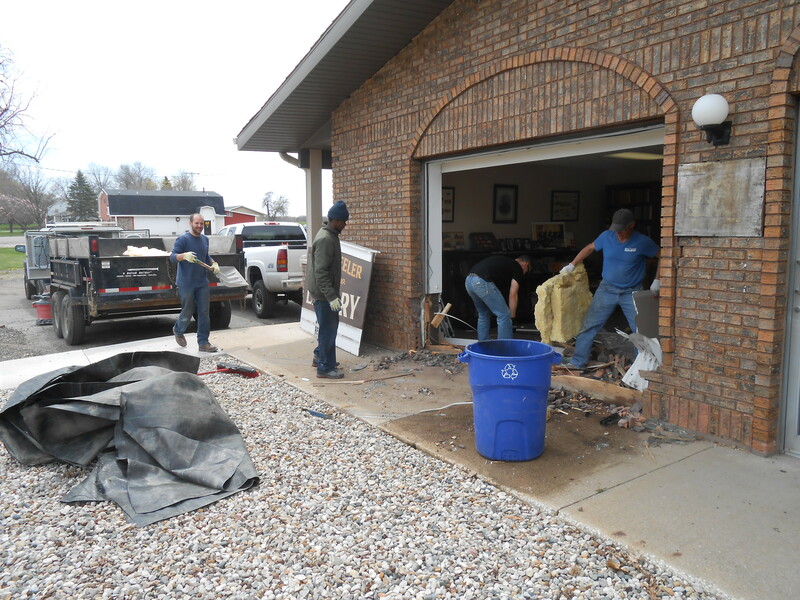 Because the library is run by the township, the township is taking care of all the insurance and construction whatnots. Those what nots are a lot of work! 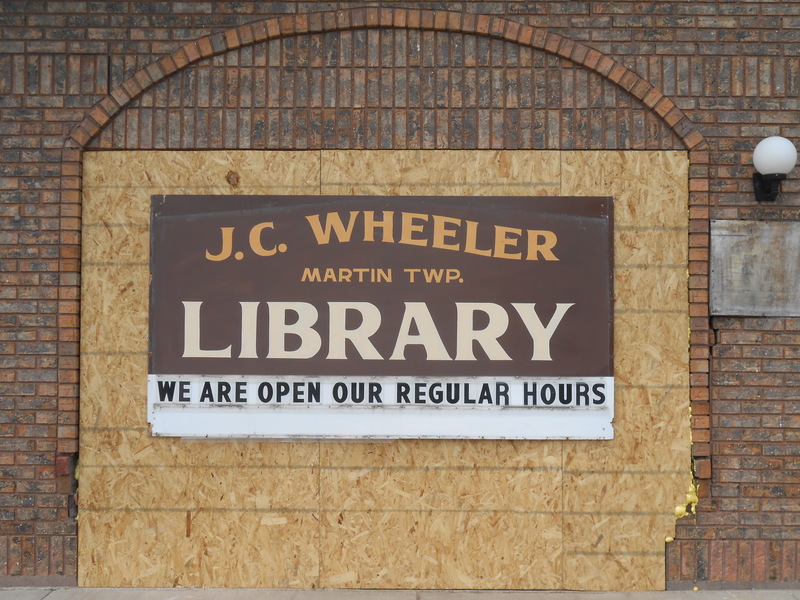 We do not know when new construction will begin on fixing the library. Not having the front room does pose a bit of an issue as we come up on our Summer Reading Program. Some programs we were in the works of had to be scrapped and we had to get really creative really fast for our teen council that meets every Monday in the front room during the summer. The writer’s group has been floating about – but really, we have given them great writing material from all this! 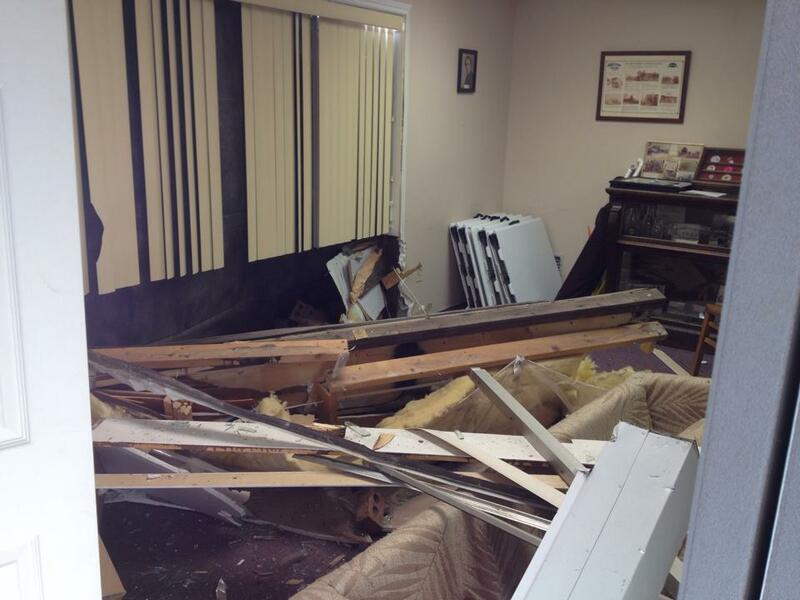 We just wanted to give you an update on the front room. The update is basically this – WE HAVE NO IDEA. But you knowing we don’t know helps you to understand where we are as well! 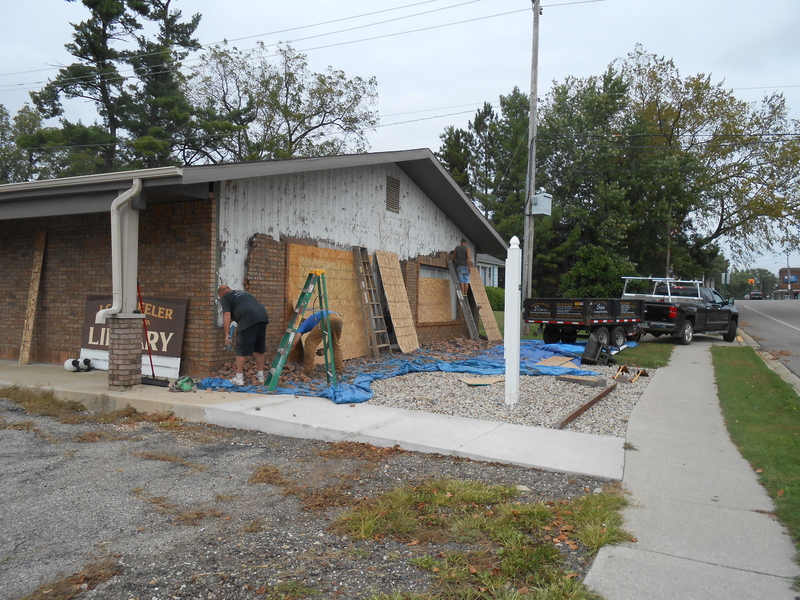 We will be keeping you updated when construction does begin and we plan on taking pictures when that does happen. But as for the library, it is work as usual and we are happy to help our patrons with all their book needs. Be sure to check in often as we prepare for our Summer Reading Program – Every Hero Has A Story – this mid June. June! How is it June already? 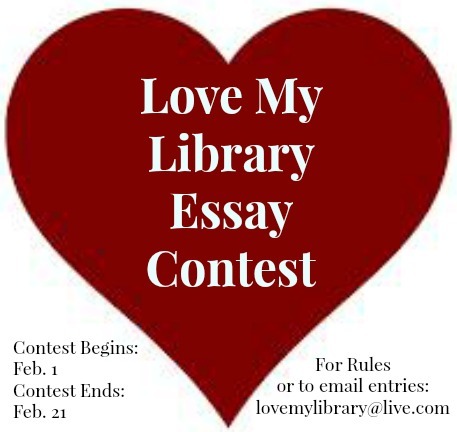 Love My Library Essay Winners Announced! Our Love My Library Winners have been contacted and their winning essays are posted on our wall next to the Newsletter display. We enjoyed reading all the wonderful things people wrote throughout the month. Our K-6th grader winner was chosen by a volunteer team from Teen Council. Our Teen/Young Adult and Adult winner was chosen by a non library employee who wishes to remain anonymous. But THANK YOU to this individual who was so very helpful! We wish you all could have won! Thank you so much to everyone for sharing your love of the library with the community. Below are listed the winning essays just as they had them written. Why I love MY Library!! I love my library because, it is an awesome place to go. Miss Alicia, Miss Nan, and Miss Alice are all awesome people who have patience, they come up with fun things to do, and they are VERY kind. The Library impacts my life because I am around more people (not just school friends and family) who appreciate me. There are so many books to read that they help me with school, school essays, and I can find random books to read for fun or to look up something I want to learn. I am happy to come to the library because friends are there and it gives me something to do on a Saturday morning. I appreciate my library because the place is clean, there are all nice people there, and they have fun things to do. They take there time to plan things for people to do. They also have fun things for all ages, from 5 year olds to 12 year olds. That is why I love MY library! I really love the JC Wheeler Library because the people there are very friendly, kind, awesome, talented, and the environment isn’t as many of the other libraries I have been too. It’s not sterile, but instead is very invititing. When you walk in you aren’t greeted by someone putting on a fake smile, quickly saying “hello” and then going back to their work. At my library it’s “Welcome!”, “Hello!”, and “How are you?” with a real smile! At the JC Wheeler Library, they are happy to see you! I hope this characteristic stays within the library for many years to come. My library has many different events and activities going on all year round! Once a month the Teen Council gets together. We do activities, projects, and of course there are always yummy snacks that Denise and Alicia make, and pop to drink. Tenn Council is something I look forward to doing each month. The Writer’s Group also gets together once a month, and is filled with very talented (and published) writers! Since joining the Writer’s Group, I have learned a lot from them all on how to improve my writing, and I go to them whenever I need help. If you love writing, you’ll love the Writer’s Group! Every summer there is an awesome event put on by our local library…drum roll please…the Summer Reading Program! The library kicks off the Summer Reading with awesome outdoor fun. There are games, face painting, and much more to get you pumped up about the Summer Reading Program! This is one of my favorite times of the year because I can actually get prizes (if my name is drawn) for doing something I love: reading! There are always fun events to go to, and it’s for ALL AGES! That’s right adults, you can join too (and win prizes!)! I have never done a better Summer Reading Program than what our library puts on every year! Twice a year there is a book sale at the library. There’s tons of books to choose from, and the prices are really good! If you love books, this is the place to be! I really appreciate the JC Wheeler Library. I know how much work our librarians put into the library. They check in a check out your books, they call you to let you know that your MEL books are in, and they have to unpackage all those MEL books, audiobooks, dvds, and cd’s you order. Which believe me, there are times when they have to unpackage twenty books I ordered, just so I can read them! I really appreciate how much work our awesome librarians put into our wonderful library. I am thankful for this opportunity to say how much I, along with my family, love our library. J.C. Wheeler Library is outstanding as a public library in so many ways; the one reason that stands out above the rest is the staff. The librarians are genuinely kind, helpful, and always happy to help find a book or answer a question. Everyone that enters the library feels truly welcome. They also do a great job at showing how fun reading can be for all ages. The “blind date” paper covered books was truly fun! The library is well laid out with a wonderful selection of books. I love picking out books on MEL as well! Children are made to feel truly welcome and encouraged to enjoy time at the library. My children think it is great that they can read books from the library for Accelerated Reader points at school. The quality of the special events that the librarians put together is highly impressive. The Summer Reading club was educational and fun. We were introduced to local talents and places of interests. Each event introduced a new topic and we always left with a book on that subject! I also really appreciated how the reading program for the older children was more involved with the opportunity to write short book reports and more. As an adult I greatly enjoyed the adult reading club that also gave us an opportunity to share our thoughts and review of the books we were reading. Thank you for introducing new interests to children and adults! I also love how the library supports the local community. The library does a great job of keeping the community informed through the library’s Facebook page about library and local events. Thanks to the library we were made aware of book club events, parades, the first Winter Festival, quilt drawings and so much more! One of my favorite events is the library Book and Bake Sale. We always leave with bags full of fantastic books and plates of goodies. I greatly appreciate all the work that goes into these wonderful events. Having a wonderful local library to go to for great books and resources is something that I am truly thankful for. I can honestly say that I LOVE my library! 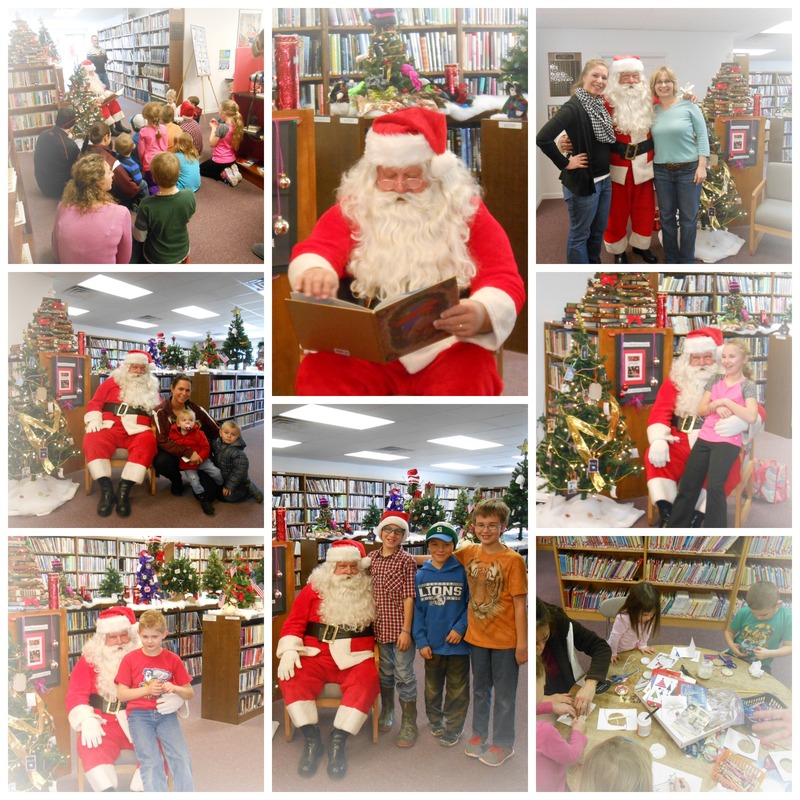 It was such a wonderful treat to have Santa Clause come to visit us at the library again this year. He seems to have a very special place in his heart for all the Martin children – young and old. Don’t forget to friend us on facebook and read our Monthly Newsletter! Do you have outstanding? Bring in your non-perishable foods to pay your library fines! Please check ALL expiration dates before bringing food in. All food donated will go to the Martin Resource Center. This program begins on October 1st and will run through November. 1 item = $1 in fines. All transactions are done at the discretion of the staff. 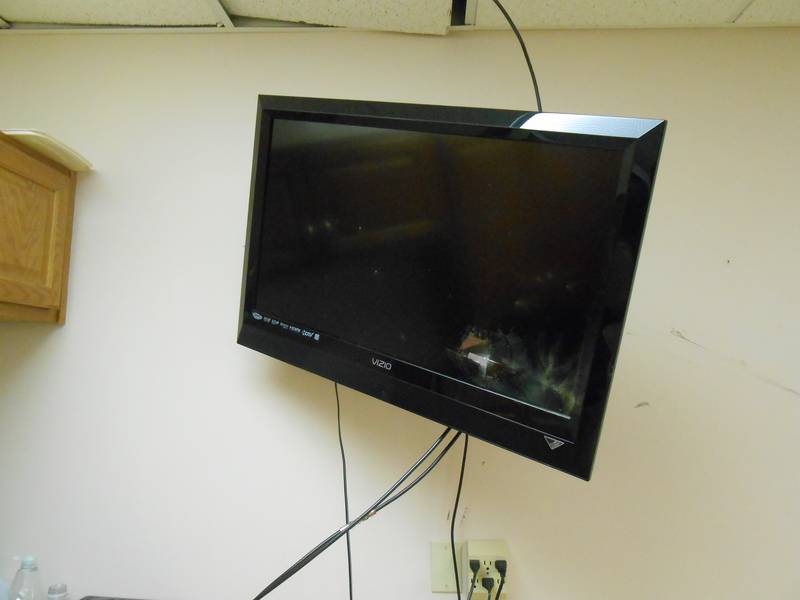 Food Donations DO NOT include Payment for Lost or Damaged Library Items. Here is a little library secret: You ALL probably have fines. Seriously. Just bring in food and check. And if you are one of the lucky ones don’t have fines, awesome. Donate food for the good of it! Let’s all help make our local Martin families in need have a great Thanksgiving and winter!